The first Dominicans arrived in Lithuania in the 13th century. Vitas, the first Bishop of Lithuania, was a Dominican, and Mindaugas, the King of Lithuania, was baptized by a Dominican named Henrikas. It appears that later there were no Dominicans in Vilnius for a few centuries. The next reference to the Dominicans in Vilnius occurred in 1501, when they established their first monastery and the Church of the Holy Spirit. In 1647, when the Dominican Province of Lithuania was established, this location became the headquarters of the Dominican Order. According to the records in the Dominican chronicles, there were sixty monks living near the Church of the Holy Spirit until the mid-17th century. As the number of monks increased, they settled in Lukiskes and Verkiai (currently Vilnius Calvary) suburbs of Vilnius. In the 19th century the thriving Order of Dominicans was banned by the tsarist authorities. It was briefly restored during the interwar period, but was again banned by the Soviet government. In 1993, after Lithuania had regained its independence, the Church of Sts. Philip and Jacob and the monastery were returned to the Dominicans, who relocated there shortly thereafter. Today, the monks not only serve the faithful in the community but also organize events to interact with all local residents, such as arranging concerts of classical and sacred music by collaborating with the Academy of Music. Dominicans have had a significant impact on Lithuania and its Catholic Church, due to their lengthy presence in the country. As part of the Dominican legacy there is a long standing devotion to St. Dominic, the founder of the Order, and to St. Hyacinth (Lith. : “Jackus”), one of the most notable missionaries to the Lithuanian lands. 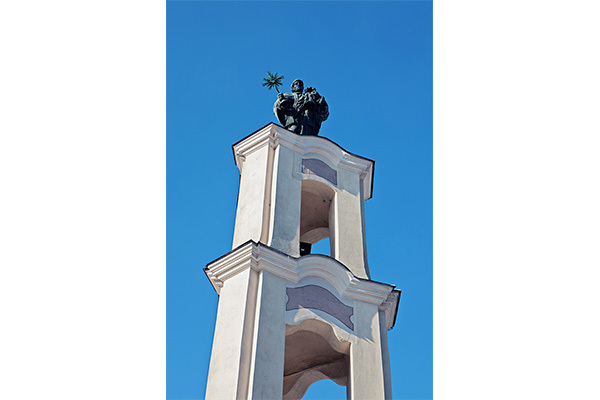 Devotion to St. Hyacinth, the patron of Poland and Lithuania, can be traced back to a chapel built in his honor in 1501, which still stands today on Konarskio Street, near the former Vilnius City limits. Another integral part of the Dominican legacy which they brought to Lithuania, is the devotion to the Way of the Cross, called Calvaries. In the Vilnius suburb of Verkiai Dominicans built the Stations of the Cross, along with a Late Baroque-style church and monastery. The prayer of the Holy Rosary was also made popular by the Dominicans. According to Catholic tradition, it is believed that the Rosary was given to St. Dominic in 1214, by the Blessed Virgin Mary herself. Pope Pius V, who was a Dominican, established the prayer of the Rosary in the Universal Catholic Church in 1569. The prayer consists of the Joyful Mysteries, the Sorrowful Mysteries, and the Glorious Mysteries, with the fourth set of Luminous Mysteries added in 2002, by Pope John Paul II. The monks of the Dominican Order, also known as the Order of Preachers, were extremely well educated and were promoters of literacy in Lithuania: they prepared and published works of philosophy, theology and religious history of their Order, as well as dictionaries, didactic books, sets of sermons and the lives of the saints. This Church is included as part of the following itineraries: Places of Veneration of Our Lady, The Route of St. James. This Church is included as part of the following itinerary: The Route of Divine Mercy. It is believed that the first Gothic church at this location stood since the times of Grand Duke Gediminas and was destroyed by the crusaders. In 1408 Vytautas the Great built a new church. At the beginning of the 16th century Alexander, the Grand Duke of Lithuania and King of Poland, transferred it to the Dominican Order. After several fires in the 17th century, the Church of the Holy Spirit was reconstructed in a Late Baroque style. The Church interior, decorated in a Rococo style, is regarded as one of the most treasured Lithuanian church interiors. The Church is also renowned for its almost-original 18th century organ, sixteen altars and for its crypts, which for centuries have been used as a burial place for residents of the City, victims of plague and other epidemics, and the soldiers of Napoleon’s Army. After the uprisings of the 19th century, tsarist authorities closed the Dominican monastery and established a magistrate office, apartments, a prison and secret institutions supporting the war industry, on its premises. In 1986, due to the initiative of the pastor of the Holy Spirit parish and current Bishop of Grodno, Aleksander Kaszkiewicz, the original image of Divine Mercy was returned from Belarus and, after restoration, displayed in this Church for public veneration. In 1993, during his visit to Lithuania, St. John Paul II prayed in front of the image of Divine Mercy and met with Lithuanians of Polish origin and Lithuania’s Polish Catholics. A memorial plaque was placed near the entrance of the Church to commemorate the event. Following the renovation of the nearby Church of the Holy Trinity, Cardinal Audrys Juozas Backis founded the Shrine of Divine Mercy on this site. The image of Divine Mercy was relocated to this Shrine pursuant to the decree of the Cardinal in 2005. In 2015 the Archbishop of Krakow, Stanislaw Dziwisz, presented a relic of St. John Paul II’s blood to the parish of the Holy Spirit. The relic, which is especially precious to the parishioners, is incorporated into St. John Paul II’s altar, located in the right nave of the Church. This Church is included as part of the following itineraries: The Route of Saint John Paul II, Places of Veneration of Our Lady and Vilnius Calvary Way of the Cross. St. Hyacinth was one of the first monks to be accepted into the Order by St. Dominic himself. After completing his novitiate and taking his vows, St. Hyacinth, along with the other brothers, was sent to the missions in Poland. When the Dominican Province of Poland was established in 1228, St. Hyacinth was appointed as its provincial, but refused this title. He worked as a missionary, primarily in Russia, Prussia and Poland. It is believed that he also visited Lithuania (around 1231), Latvia, Denmark, Sweden and Norway. For that reason, St. Hyacinth was known as the “Apostle of the North.” There is a legend which describes how St. Hyacinth miraculously saved the monstrance with the Blessed Sacrament and a Virgin Mary statue, while being attacked by the Tatars in Kiev. As a result, the iconography usually depicts this Saint holding a monstrance or chalice in one hand, and the Mother of God with Child sculpture in the other. He died on August 15, 1257, in Krakow. His liturgical celebration is on August 17th. He was beatified in 1527 and declared a saint of the Church in 1594. In 1686 Pope Innocent XI named him a patron of Lithuania. In 1501, the Dominicans built a wooden chapel near the former city limits of Vilnius to honor St. Hyacinth. Since he was considered the guardian of travelers, the chapel was intended as a place of prayer for those leaving Vilnius on long journeys. The chapel was constructed of masonry materials in the Baroque era, with a new statue of St. Hyacinth created in 1901. The old wooden sculpture was transported to the St. James and Philip Church and was placed in the Chapel of St. Hyacinth.